I always love to read Brain Pickings. 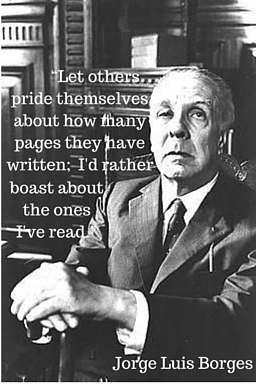 In one of her recent posts, Maria Popova explores the work of Seven Conversations with Jorge Luis Borges, focusing on the meaning of success in literature. It got me thinking about why I write. The difference between literary success today and when Borges was younger (he lived from 1899 to 1986) is striking. Apparently, talking about sales was bad form when he was younger. If you’re writing for money, he implies, you write poorly. …[O]ne now thinks of sales. I know there are writers who publicly announce they’ve had their fifth, sixth, or seventh edition released and that they’ve earned such and such an amount of money. All that would have appeared totally ridiculous when I was a young man; it would have appeared incredible. Can you see the parallel between writing for money and writing for clicks, tweets, and shares? Today, there are books written about how to make your book a bestseller! There are entire websites dedicated to maximizing your website’s or blog’s potential, from SEO to catchy headers. The commercialization of literature, Borges says, has influenced writers so that they now write to sell. The writing environment today is so different compared to when Borges wrote as a young man. Now, there is so much noise. It seems everyone wants to write and be published, and now they easily can via blogs or publishing their own e-book. And if you write for a living, you want other people to care about what you write, and to buy it. Writers want to get the reader’s attention. How many novelists don’t dream of making the New York Times Bestseller list? How many bloggers don’t count their page views? Times have changed. Today, with all that noise out there, many writers feel they must keep an audience in mind. The amount of chatter around any given subject is so clamorous, you need to pull out all the SEO, headline, and bestseller tricks you can. The notion of the “bestseller” shares cultural genes with the “blockbuster” and the “hit” — notice how very violent our laudatory language tends to be — and yet the success of literature, Borges suggests and countless other writers have corroborated, is measured by an entirely different metric of inner light. But Maria Popova’s post and Borges’ observations are valid for writers of all types. It makes you ask, Why do I write? When writing online, surrounded by interesting websites, articles, and cat videos, it’s especially easy to forget the integrity of your subject, of who you are, or how you present your ideas to the world. You leave behind the reason you’re writing, and just want the maximum number of viewers. But her post was a very good reminder to write because you love it – because you can’t not write. It was a reminder to focus on what you’re passionate about or what interests you, not results. And of course, if what you’re writing isn’t interesting to you, you can be sure it won’t be interesting to anyone else. If you’re not writing because you really love it, it’s hard to imagine you’ll stick with it. Writing is a life-long skill and passion that many writers feel they have to do – there is a story, or many stories, within them that must be told. Of course, we don’t want to tell these stories to ourselves. But as writers, we do want to remember why we’re writing in the first place. Needed to see a post like this today! Didn’t know about brainpickings. Looks like a great site. It’s a great site! She always posts thoughtful articles on books I want to read (but never get around to). And they’re just the right length. Glad to introduce you to the site! What a lovely exploration into why we write. We can’t not write rings so true. You know you’re a writer when you’ve been writing for as long as you can remember, because you must. Beautiful post, Diana. Thanks for letting us peep into your soul and for the food for thought about our own writing. Thanks for reading! Brain Pickings definitely gives me food for thought, so I’m glad I was able to do the same. First of all, what a life you lead! I’ve always wanted to go to Italy; almost made it in 2013, but settled on visiting Paris. Thanks so much for sharing this post and bringing attention to Brain Pickings site. Oh, but Paris is not settling! Beautiful city. You need to visit Italy too though! Brain Pickings is always an inspiration or interesting read for me. I agree that it is important to write about what we love, but I believe it is also important that we write for others. If we write only for ourselves, it is easy to become self-indulgent and sloppy in our writing. If we want others to read our writing, we will work to hone our craft, even though the process may at times be painful. I completely agree, Lynn. Honing your craft is very important. Keeping an audience in mind is very important. But sometimes the end goal becomes how many times an article is shared or viewed, disregarding the telling of the story, giving advice or tips, improving craft, and everything in between. There are lots of reasons for writing; what’s important is to keep a balance between them. I’m with you on Brain Pickings. It’s been one of my favorite sites for a long time. Also, great article. Being a freelance writer, you’re often forced to write in a style that isn’t yours – one that’s written to get clicks. It can feel very forced. Thanks, glad you enjoyed it. It’s not that writers and bloggers don’t want clicks, of course; but it’s easy to get caught up in that and forget the reason you’re writing in the first place.